At this moment, I can hear Stuart reading a book softly to Georgia in our bed. It’s almost her bedtime. She is bathed and fed and happy. And for this brief moment, she will sit still enough to listen to a book. You know two year olds. A calm moment spent sitting is a rarity. They’d much rather be out exploring the world. Hangin’ with their friends on the slides. Squishin’ ants in the kitchen for Mommy. Doing anything but sitting still. It rained all weekend here – and good, ‘ol, fat, Alabama rain at that. Multiple times last night I was woken up by the sheer noise of it all (well, that and the fact that my bladder is the size of an olive these days. Multiple bathroom trips are required during the wee hours of the night). Regardless, it was the type of weekend where you want to eat soup. Not necessarily because it’s cold and you need your soul warmed, but rather because it’s dark and dreary and it just fits the moment. Especially if you’re having a Harry Potter movie marathon. *Ahem*. I’m just sayin’. 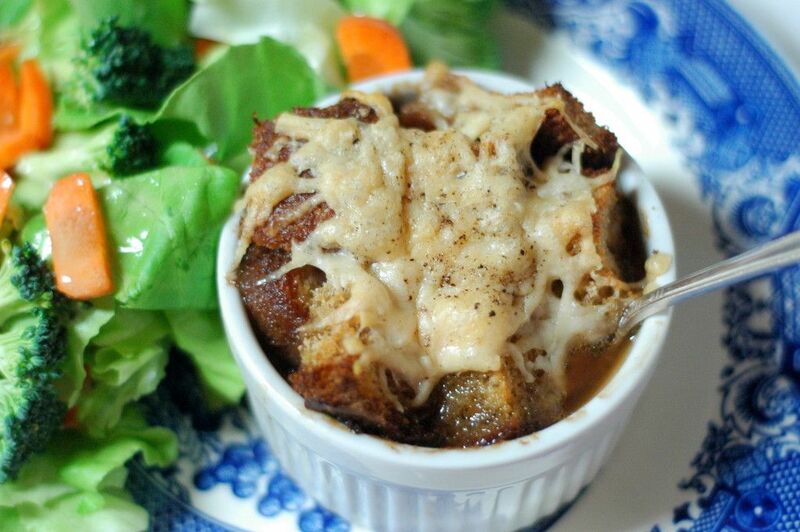 This French Onion Soup recipe is one of my favorite vegetarian soups. It’s so nourishing and rich and savory. I could eat it every day. I think you’ll love it. And since it’s fall, and we’re all in the mood for soup, let’s do this thing. Step One: Peel and slice the onions in half. Then, cut into thin strips. I use my food processor with the slicing blade to do this so I don’t end up with onion tears. I’ve done it by hand plenty of times though – just aim for nice thing strips, nothing too chunky. Step Two: Melt the butter in a large soup pot. 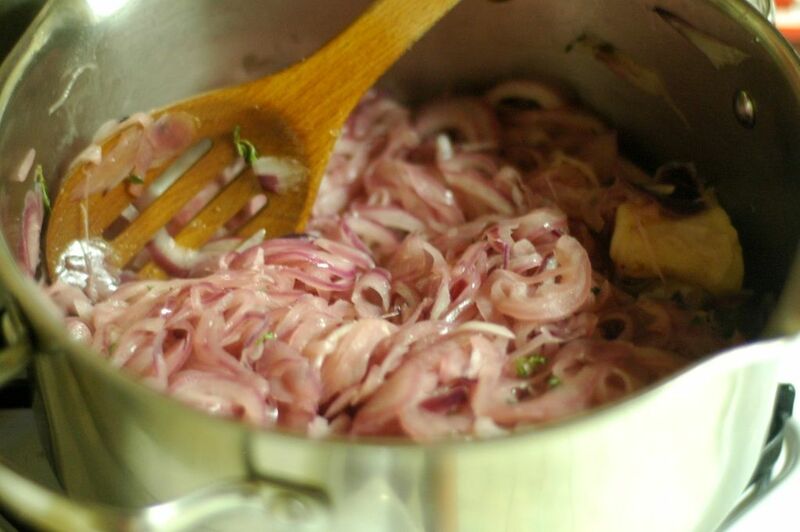 Add in the sliced onions and the thyme. For the next half hour, on medium heat, allow the onions to slowly soften. You will need to stir them and tend to them to make sure they don’t burn at all. If they become too sticky, add in a few more tablespoons of butter. The point here is to slowly allow them to darken and become sticky. 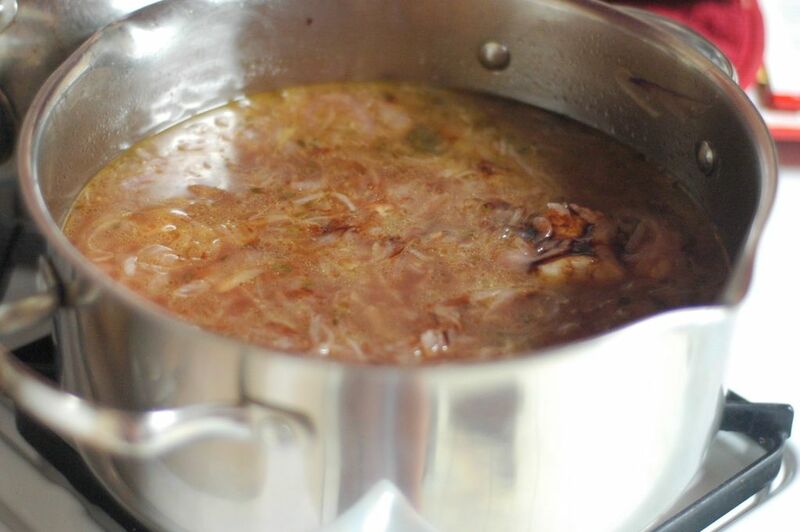 Step Three: Once the onions are nice and sticky, add in the bay leaves, chicken stock, and beef stock. Stir and bring to a simmer. Then, drizzle in the balsamic vinegar. Mmmmmmmm. Smelly good, my friends. Side note: I didn’t have any beef stock at the moment I made this, so instead of the beef stock, I added extra chicken stock and threw in two beef soup bones I had in the freezer while I sauteed the onions. The balance of beef and chicken is important and I find that this soup made with all chicken stock or all beef stock isn’t nearly as good as the two combined. Using the soup bones helped yield a wonderful beef-y flavor…so if you’re in a pinch, this is a good route to go. Step Four: Cover and allow the soup to simmer for twenty or so minutes. Now taste. Add salt and pepper to your liking. I tend to over pepper this soup. Because that’s the way, uh huh, uh huh, I like it, uh huh, uh huh. Step Five: Once the soup has simmer and is spiced to your liking, gently scoop a serving into an oven-safe dish. I use these small ramekins because that’s all I’ve got! I usually make two for each of us, since they’re pretty small. If you have larger oven-safe bowls, by all means, go for it. Step Six: Top each ramekin with a piece of crusty bread…this time, I had some old soaked whole wheat bread, so that’s what I used. I love the wheaty note it brings to the soup. By all means, use what you’ve got. Step Seven: Lastly, top each serving with a few tablespoons of grated Swiss or Parmesan cheese. Swiss is the traditional cheese that is used in French Onion Soup, but girlfriend didn’t have Swiss – girlfriend had Parmesan. And frankly, it’s still delicious – just not quite as ‘melty’ as Swiss. A small price to pay for Parmesan’s incredible flavor. Step Eight: Place all the ramekins on a baking sheet and put into a 450 degree oven for about 5-10 minutes or until the bread is golden and the cheese has melted. I. Love. This. Soup. It’s like I become possessed when I eat it…and I just can’t stop. Especially when it’s fall and rainy and I’m watching The Prisoner of Azkaban. Would you believe that I made five ramekins? And ate three of them? Three, people. Stuart ate one. Georgia ate one. I ate three. I (yep, you guessed it) have issues. And my issues involve melted cheese and caramelized onions. Whether you have issues or not, I’d still encourage you to make this soup. Not only is it frugal, but it’s also full of nourishing broth and downright delicious. 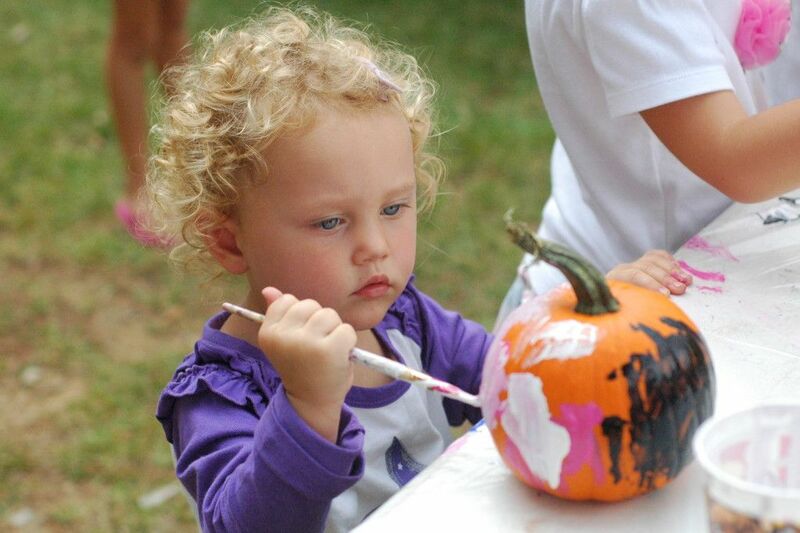 This post part of Simple Lives Thursdays! Peel and slice the onions in half. Then, cut into thin strips. Melt the butter in a large soup pot. Add in the sliced onions and the thyme. For the next half hour, on medium heat, allow the onions to slowly soften. You will need to stir them and tend to them to make sure they don’t burn at all. If they become too sticky, add in a few more tablespoons of butter. The point here is to slowly allow them to darken and become sticky. 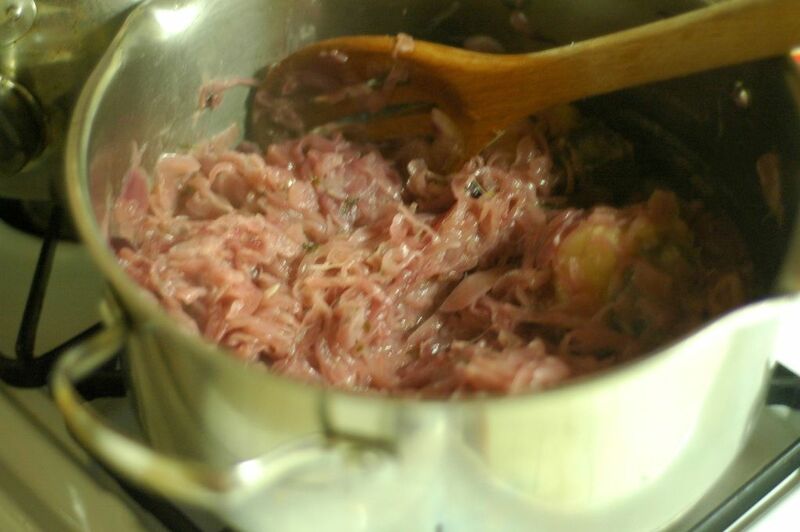 Once the onions are nice and sticky, add in the bay leaves, chicken stock, and beef stock. Stir and bring to a simmer. Then, drizzle in the balsamic vinegar. Cover and allow the soup to simmer for twenty or so minutes. Now taste. Add salt and pepper to your liking. 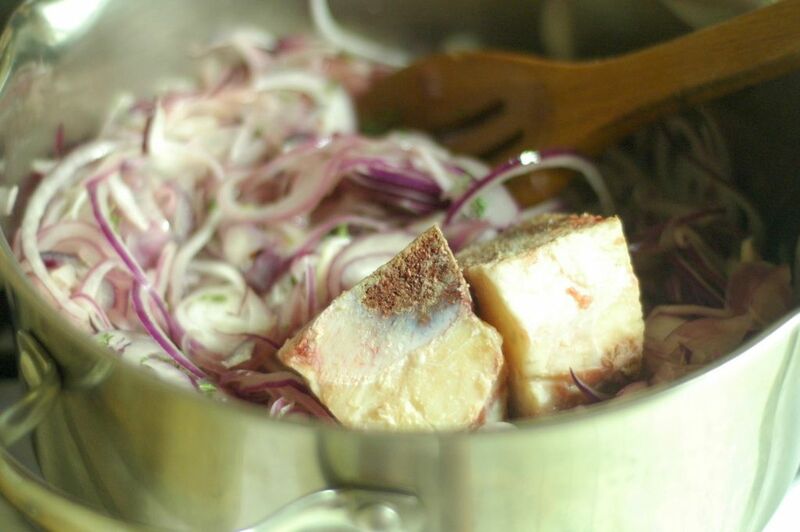 Once the soup has simmer and is spiced to your liking, gently scoop a serving into an oven-safe dish(es). 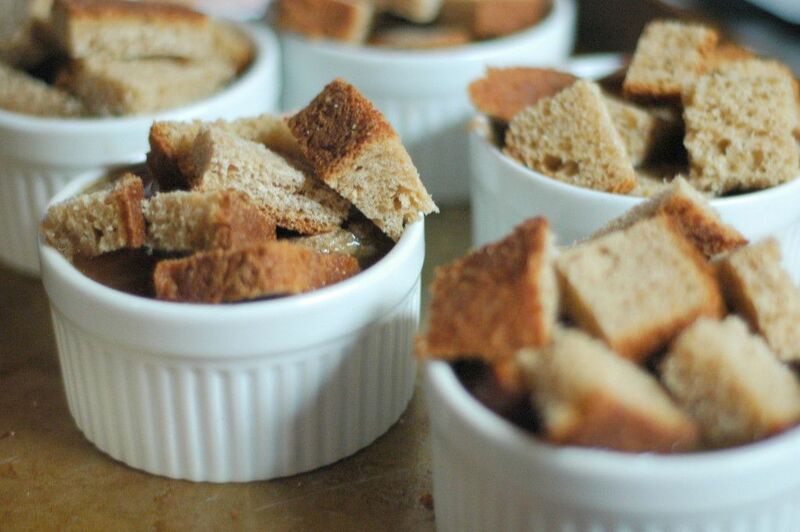 Top each ramekin with a piece of crusty bread. 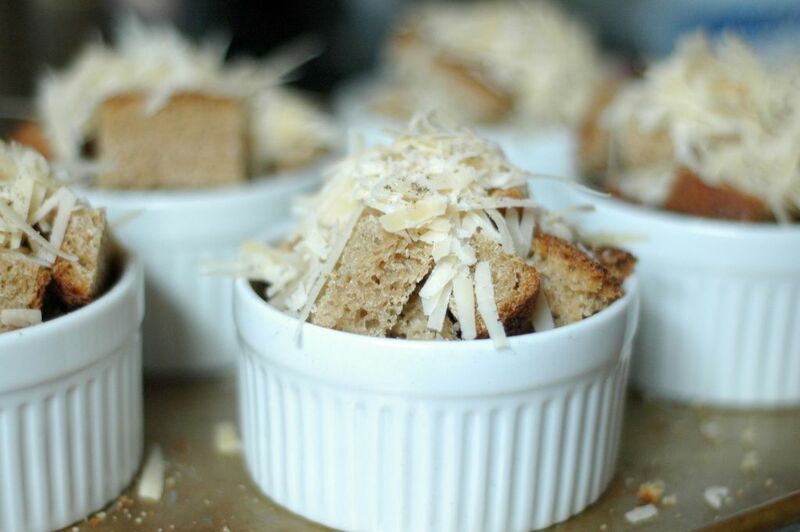 Lastly, top each serving with a few tablespoons of grated Swiss or Parmesan cheese. 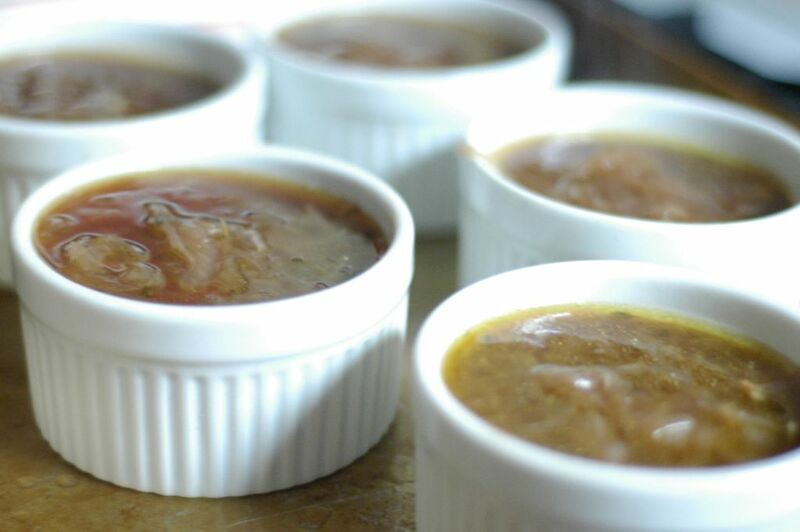 Place all the ramekins on a baking sheet and put into a 450 degree oven for about 5-10 minutes or until the bread is golden and the cheese has melted. « With a dash of cinnamon. I made the soup and it was fantastic. More then fantastic! I didn’t have homemade broth, so I used canned beef broth and chicken bouillon. If the soup tasted amazing that way, I can’t even wait to taste it next time, when I make it with homemade broth! Yum! Good reminder that it is indeed time for French onion soup again. Love it with garlic toasts and a really good gruyere. We’ve always used vidalia or walla walla for their sweetness, but I can see where red (or a mix of both) would be good as well. Made this today and was praying it was good…stirring onions for 1/2 an hour was SO worth it! It was delicious and the whole family loved it! Thank you for the recipe! Ordering your cookbook today! I only have apple cider vinegar, would that be an acceptable substitution? Has anyone tried that before? You may need to add a few tablespoons of maple syrup to bring in that depth of flavor that comes from the balsamic vinegar.